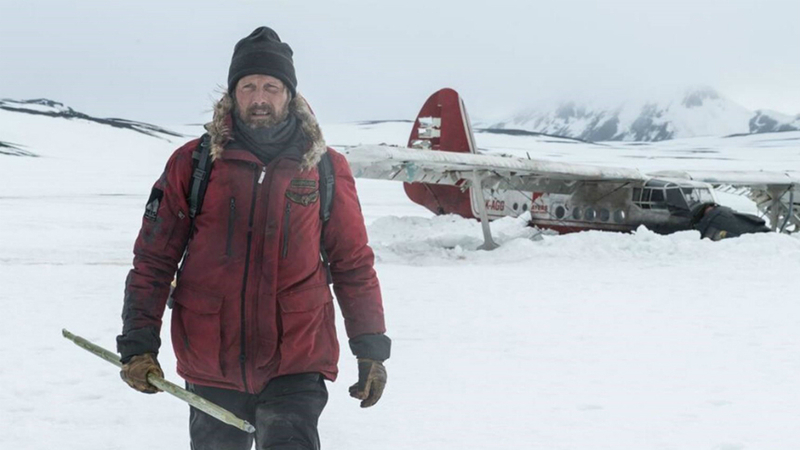 Mads Mikkelsen stars in director Joe Penna's wintry tale of survival. Unlike nearly all other films of its sub-genre, Arctic declines to provide any introductory background information on its lone man surviving against all odds, alone in the wilderness. That man is Mads Mikkelsen, though, which makes all the difference in the world. Ever since his stunning feature debut in Nicolas Winding Refn's Pusher more than 20 years ago, Mikkelsen has cut a singular path through cinema, first in Scandinavia, where he demonstrated his versatility in all manner of dramas and comedies, and then exploding on Hollywood's radar as a preternaturally nasty villain in Casino Royale, which he later expanded upon in TV's Hannibal. Under the skillful direction of Joe Penna, the first few minutes reveal a fair bit about Overgård and his situation. He survived the crash of a small airplane and has fashioned a shelter for himself inside. Each day, he fishes for his meal through the ice and snow that surrounds him, carefully tracks his location on a map, and signals for help. His physical condition is slowly worsening. Then he sleeps. He is waiting for rescue. It is safe to say that he has carefully calculated that it is better to stay and wait where he is than to try and reach any habitation. He knows his limits and wisely stays within them. How long, however, can he wait for a rescue that may never come? In the original screenplay, written by Joe Penna and Ryan Morrison, clues are sparingly parceled out, yet the true definition of Overgård's character is revealed through his actions. He is firm and determined and stoic. He wants to live, yet he remains a compassionate individual who willingly puts the interests of others above his own, as demonstrated when he is unexpectedly joined by another (barely) living soul. Director and co-writer Joe Penna hails from Brazil. 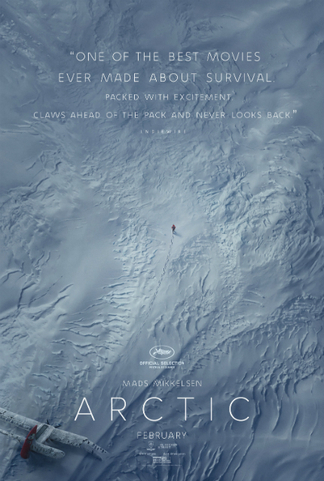 He gained experience by directing multiple TV shows and short films before making his feature debut with Arctic, which is quite an epic achievement, a tribute to Penna and his crew members for creating a world that feels completely isolated, yet familiar, in that we've all seen frozen conditions on screen before. Seldom, however, have such conditions felt so lonesome and fraught with peril. Not to overstate the obvious, but Mads Mikkelsen is magnificent as Overgård. In the past, I thought I might be happy to watch him read a telephone directory for two hours. Arctic is shorter than that, but it is a grueling experience. Countering the desperation that develops, Mikkelsen makes it easy to root for his character. He is a quiet man; we don't have much data about him or his personal life, which makes his actions all the more heroic, and always compelling to watch. P.S. You'll want to bring a sweater to watch Arctic; the cold is palpable. The film opens in U.S. theaters on Friday, February 1, 2019.